He found himself a little short handed this fall and asked me if I’d like to come out to Bend, Oregon to be a guide on a three day float down the Deschutes. 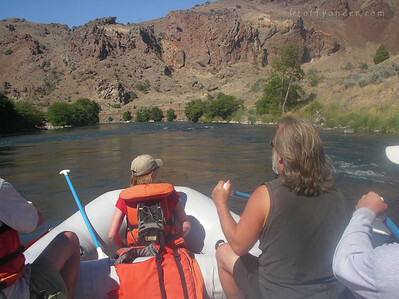 This wasn’t just a regular group of recreational clients, this was a geology class from Western Oregon University. What better way to conclude a 10-day geology field trip in central Oregon than with a trip through a natural slice in the earth where many of the geologic layers are reveled? It’s a rafting classroom. Perfect. The beauty of this trip is the prof was the man in charge. All Eddie, our cook Dave and I had to worry about was getting boats and gear down the river and food on the plates. The rest of the program was run by the prof. If I had everything in camp set, I would join the class on their little excursions away from the river as they investigated rocks. Good times. This entry is filed under: Blog, Education, Raft, Science, Water.